Apple is hoping dynamite comes in small packages. Its new iPhone, unveiled on Monday, goes back to the smaller form factor used in the iPhone 5s and earlier models with a screen size of just four inches. Claiming the iPhone SE is the most powerful 4-inch smartphone ever made, Apple said many customers have requested the reintroduction of a smaller iPhone. With the SE, which comes in four colours — including the popular “rose gold” — Apple has not skimped on the internals. The phone comes with a 64-bit A9 processor and embedded motion co-processor, offering the same processing performance as the iPhone 6s. Apple said the new phone also matches the graphics performance of the larger 6s. The SE has a 12-megapixel camera capable of capturing video in up to 4K resolution. Other features include 4G/LTE up to 150Mbit/s along with support for a wide range of LTE spectrum bands. It also supports 802.11ac Wi-Fi up to 433Mbit/s. Like its bigger siblings, the iPhone SE comes with a fingerprint reader and near-field communication technology, with support for Apple Pay tap-and-go mobile payments. 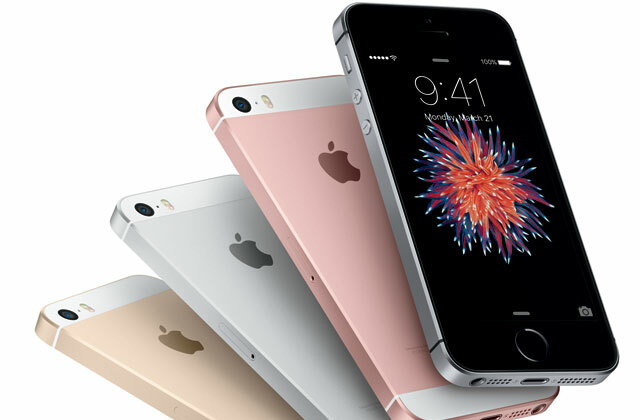 The iPhone SE comes in two models, a 16GB version for US$399 and a 64GB version for $499. Apple said the phone will be available in 110 countries — which presumably includes South Africa — by the end of May. At the same time, Apple has introduced a new 9,7-inch iPad, called the iPad Pro. For the first time in an iOS-powered device, the new iPad Pro is available in a 256GB configuration. Is that really something to get excited about? Isn’t that because 4″ is tiny? Customers may be looking for a physically smaller phone, but why does that mean that the screen has to be so tiny? The iPhone 6s has a 4.7″ screen (not exactly huge) but the footprint of the phone is massive… almost the same as the 5″+ phones from Samsung, LG and Sony. If Apple could get over its obsession with thinness and make a 4.7″ device with a similar thickness to the SE and a bigger screen-to-body ratio, that would be a breakthrough. Google tells me that the iPhone SE has a screen to body ratio of around 60%; compared to the Sony Z5 Compact which is only marginally bigger with a 15% larger screen and a ratio of 69%.